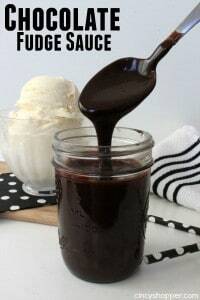 This easy Chocolate Fudge Sauce is rich and smooth making it a perfect addition to a big bowl of ice cream, waffles, fresh fruit, cake and more! Have you ever grabbed yourself a big bowl of ice cream for dessert in the evening and then thought about how nice it would be to have some hot fudge sauce to drizzle on top? It happens to the best of us. Last evening, I was in my comfy clothes (yoga pants and tee) all settled in for the evening when I realized I was fresh out of store bought hot fudge. Poor Mike had to deal with me having a bit of a meltdown, ha ha! I was just a tad bit upset. I was really looking forward to enjoying my simple evening dessert. After a few minutes of complaining, he decided he best make me some homemade chocolate fudge sauce. Luckily he is a good hubby and hates to see is wife left craving, lol. He whipped up his “go to” fudge recipe and I was able to enjoy my evening dessert without a trip to the grocery. 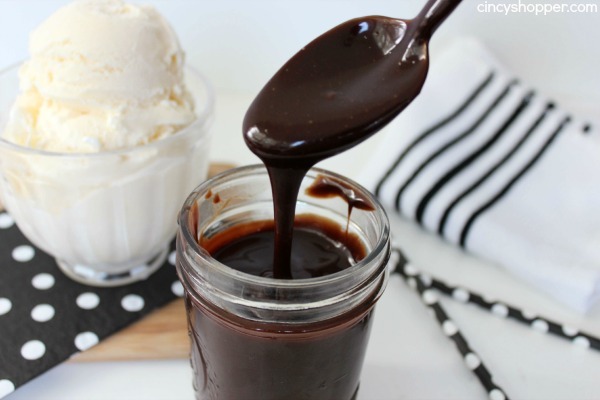 Making your own homemade hot fudge sauce at home is so simple. This recipe only requires a few ingredients and comes together in no time. You can layer it on fresh fruit, desserts and even breakfast foods too! 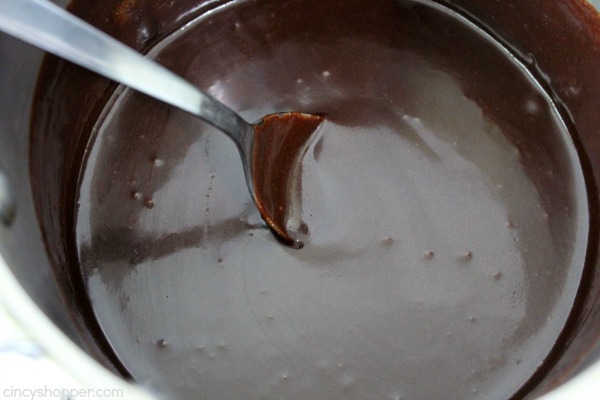 Melt chocolate by heating in microwave for 30 seconds then stirring and repeating until chocolate is melted. Transfer to a sauce pan over low heat and add butter, salt and sugar. 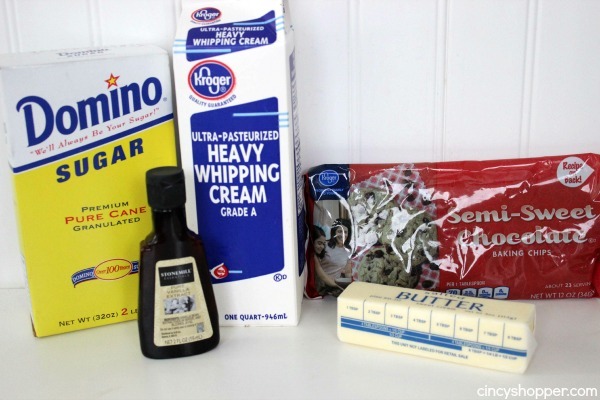 Add cream in small amount until desired consistency is reached. Stir frequently until heated, but not boiling. 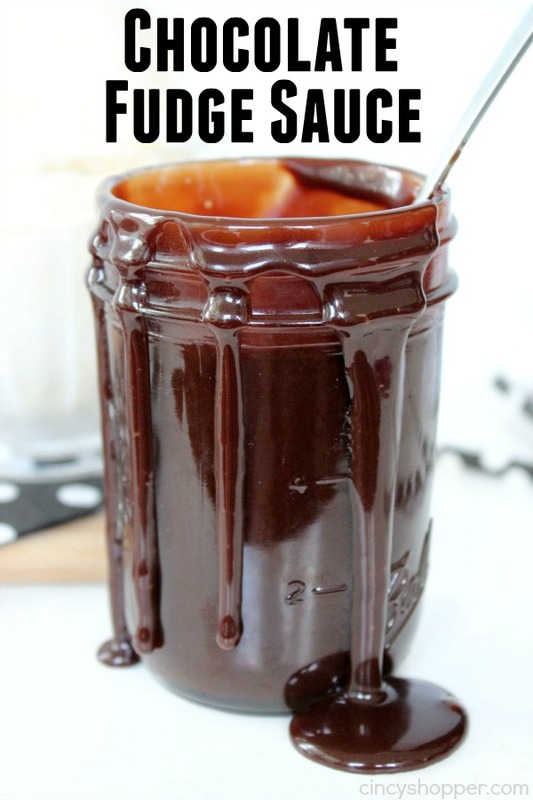 What foods do you like to top with hot fudge sauce? We really like to drizzle hot fudge over our brownie sundaes we make during the summer months. YUM… Makes our brownies just like a restaurant dessert. This sounds delicious. How do you store it? In the refrigerator? How long will it last (I know, not long, it will get eaten), seriously how long can you store this and how?